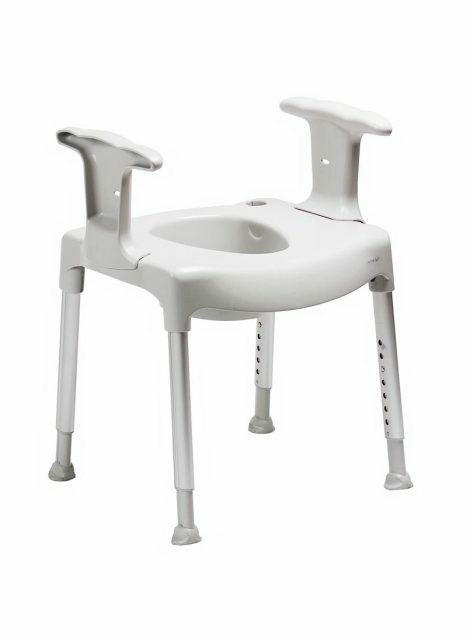 Free-standing toilet seat raiser with large base area for firm, stable support. Sturdy arm-rests enhance user security and safety. Aluminium legs can be adjusted individually to give secure contact in uneven floor conditions, and the large soft ferrules on the feet ensure a secure grip on all surfaces. Smooth polypropylene surface is easy to clean and the optional back and arm rests are simple to attach. Legs can be quickly detached for effective cleaning and ease of transport, and they have a built in locking system for extra safety. Setting the seat with a slight forward tilt can assist rising and relieve hip joints. Lightweight for ease of movement. The seat can also be used as a shower stool or it can be transformed (with the complementing accessories) into a commode. Suitable for patients up to 130kg.